Last summer I went to Barcelona with a group of my closest friends and I really enjoyed my time there, especially the food! Something I loved time and time again (mostly because it was often one of the few vegetarian options on a tapas menu) was patatas bravas, so I’ve recreated the dish at home. 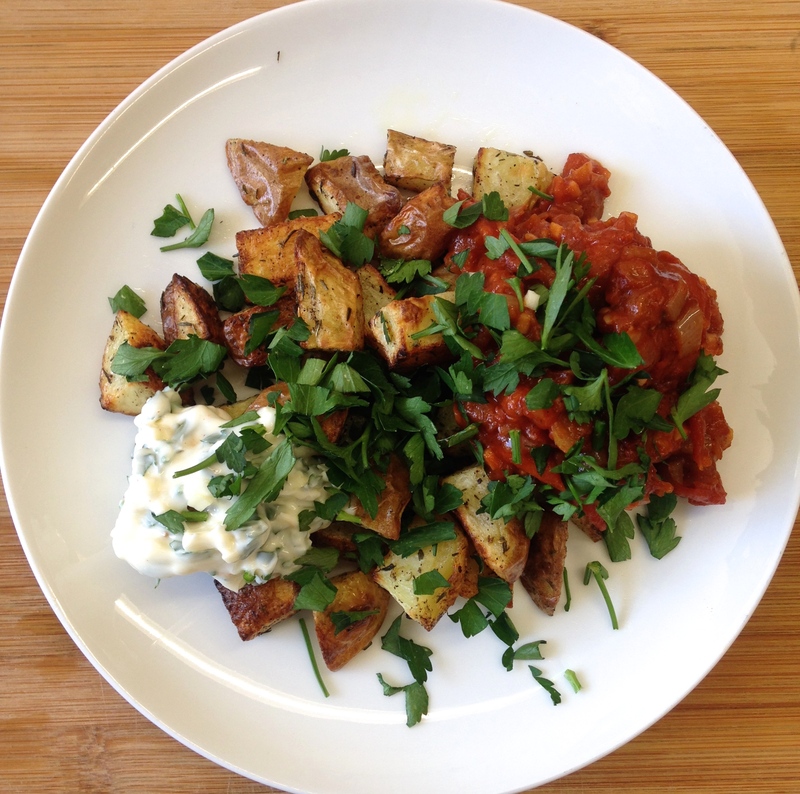 I’m not trying to create a really authentic patatas bravas, but I’ve made a tomato sauce, rich with garlic, chilli and red wine, with herby little potatoes and garlic mayo with plenty of fresh parsley. This is delicious as part of a tapas feast, or just on it’s own for a tasty lunch idea! 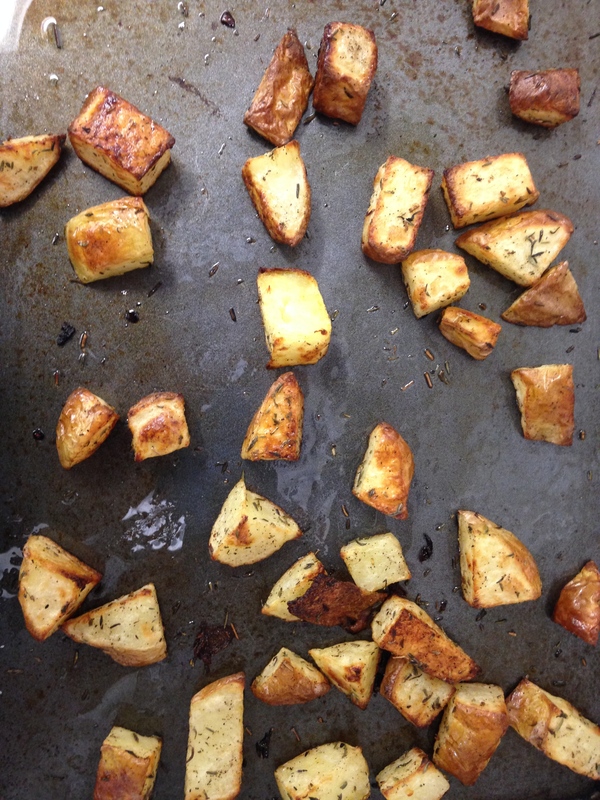 Rinse your potato and get rid of any marks or spots, then chop into cubes and place on a baking tray with 1 tablespoon of olive oil, the thyme, salt and pepper. Put in the oven at 180 degrees for 20 minutes. 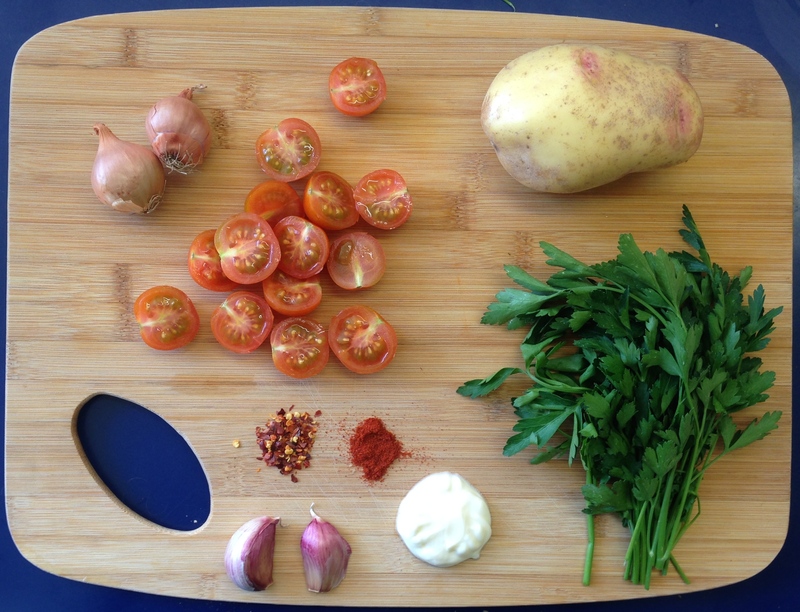 While the potatoes are cooking, quarter the tomatoes and finely chop the shallots and garlic. 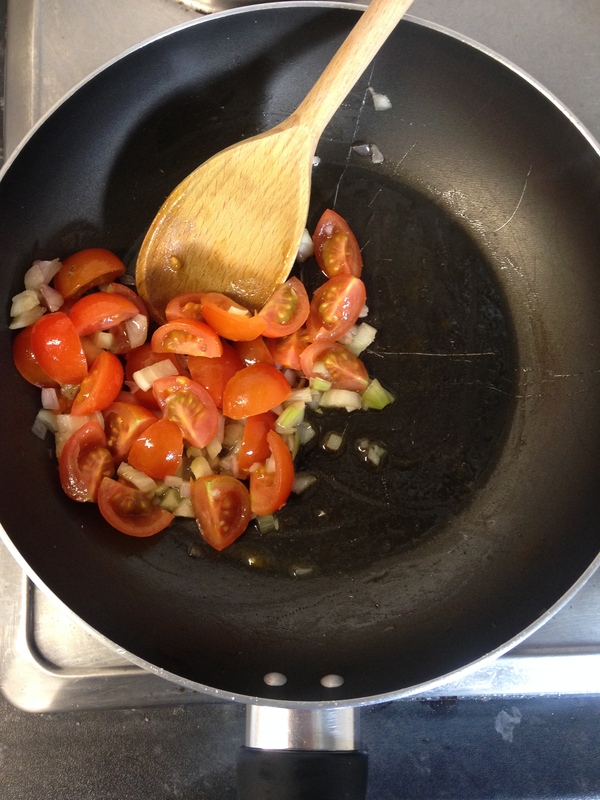 Add the tomatoes, shallots, chilli flakes, paprika and half of the garlic to a frying pan with 1 tablespoon of olive oil. Fry until the shallots are soft, then add a little bit of the water and tomato puree. 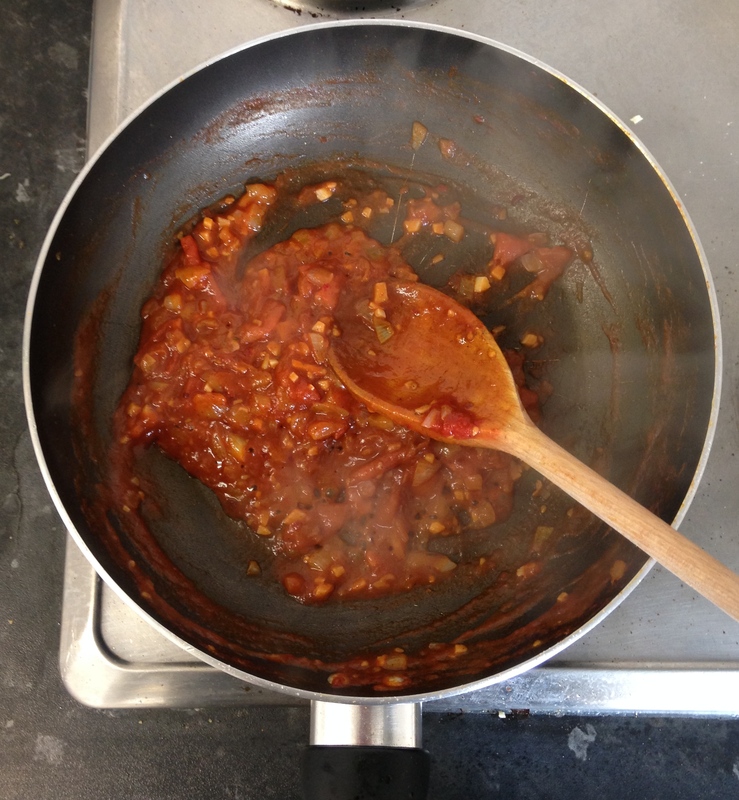 Continue to stir the sauce, when the water reduces keep adding little bits to give the sauce a loose texture. Add a splash or two of red wine (if you have it) and let it simmer away until it has a soft, dropping consistency. Add salt and pepper to taste. Add the rest of the garlic to the mayonnaise along with some of the parsley (roughly chopped). Stir through and you have a really easy flavoured mayo sauce! Take the potatoes out of the oven and put onto your plate, top with the tomato sauce and mayo and sprinkle plenty of fresh parsley on top, you could also serve this with a fresh green salad for a healthier version of this dish. If you happen to try any of the recipes I post on my blog, please feel free to tweet them to me at @b_louella or use #beankitchenblog on instagram!